IVIE is a double storey house offering panoramic views over Jervis Bay from the lounge room, kitchen, dining room and master bedroom. Access to Callala Beach is right in front of the house. Relax on the large balcony, ideal for that afternoon drink as the sun goes down. It has 4 bedrooms, 2 generous bathrooms, laundry with dryer, separate lounge and dining, balcony, BBQ, towel warmer, electric blankets, TV, DVD and video. IVIE is equipped with blankets and pillows. You will just need to provide your towels and bed linen. Bedroom 1 (upstairs): Queen bed with a large built in robe and balcony with panoramic ocean views. Bedroom 4 (downstairs): 1X double futon sofa beds plus 2X double sofa bed. This room also doubles up as an extra loungeroom . There is easy parking in front of the house. Parking a large boat or trailer is no problem. The boat ramp is close by at Callala Bay. The back yard is fully fenced. Outdoor pets are allowed with conditions. The owner will be happy to discuss this with you. 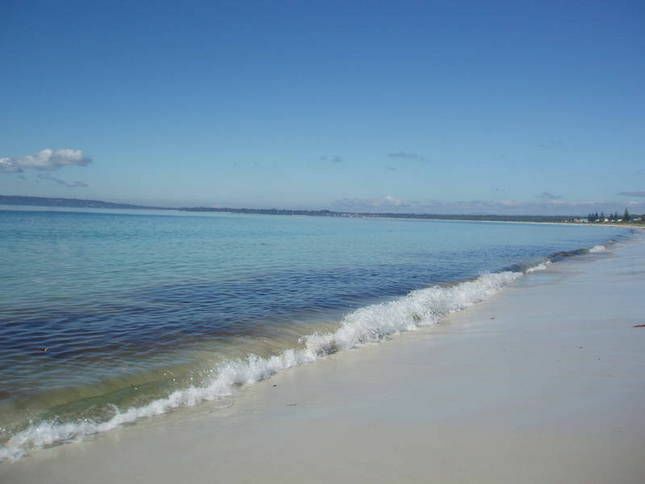 IVIE is located on Callala Beach, Jervis Bay. It is just meters from Callala Beach and a pleasant drive to places such as Huskisson, Point Perpendicular, Currarong and other great holiday locations. Jervis Bay is just 2.5 hrs from Sydney or Canberra and 20 mins east of Nowra. The property is a 5 min walk to the top pizza place and corner shop. The famous Bowling and Golf Club is even closer. Have a drink with the locals and win a prize at the meat raffle, then catch the free complimentary bus back home. It is also about 3 km away from the Callala Bay Shopping Village where you will find an IGA, chemist, butcher, chicken shop, video store, hardware, liquor shop, newsagency, hairdresser and more. There are many attractions on Jervis Bay. You can take a boat trip to watch dolphins or whales. Pods of dolphins live in the Bay and can be observed simply by going down to the beach or from the balcony. Whales have also been observed close to the beach during the migration season. Bird watchers will also be suitably impressed. Other attractions include SCUBA diving, snorkelling, fishing, boating, golf, local markets , closeness to 4WD trails and bushwalking. Callala Beach also has a tennis court available for booking. Stay at Ivie and receive a full 20% discount on the Dolphin/Whale Eco Cruise with Jervis Bay Wild (Excludes The South Coast Passage, Concession, and cannot be used with any other offer or special event). The brochures will be available in Ivie. for Bookings call or SMS . Tell them you are staying at Ivie and receive that 20% discount. House in great location but expensive and falling apart. Great location but house needs work. You can’t get your bond back if things aren’t cleaned but there’s not thing to clean with. There’s no simple condiments or paper towels garbage bags loo paper etc. for what we paid we should have had a daily cleaner. No coffee machine in a small coastal town where you have to drive to the closest coffee shop. A bit disappointing but beds were comfy and the weather was beautiful. Massive house perfect for a big group. Right across the road from the beach it was great. Neighbours are so lovely. They let us borrow their big pot. Stella was sweet and responded quickly. IVIE is a nice and big house, located directly on the beach of Calalla Beach. House has more than sufficient space and is well provided with all stuff that is needed. Clean, sufficient parking and owners are flexible for check in and out times. Another great time had. We had so much room. Great location withfantastic view - wish I could wake up to that every morning. Just a walkacross the road to the beach made it so easy and so relaxing, especiallyfor my elderly parents - they loved it. Shops close by and the club fora night out. Thanks for the stay - will be booking again. Great location, Pristine sand, Comfortable beds, Helpful owner, Extraordinary House. What else is there to say! !